Photograph courtesy Richard Howat 25173 rolls into Annan on July 17th 1985 in charge of the 17.40 Carlisle - Glasgow Central service. On the opposite track the 'Fairlie' nuclear flask train passes, running from Hunterston to Sellafield for processing of spent material, the train this day hauled by a Class 20. The twenty two year two month career of D7523/25173 included allocations to a variety of London Midland depots. Built: BR Derby Locomotive Works. Dual brake fitted (June 1978). Time between last Classified repair and withdrawal: 104 months. May 1968 to London Midland Midland Lines (LMML). June 1968 to Nottingham Division (D16). August 1972 to London Division (D01). October 1972 to Manchester Division (D09). May 1973 to Longsight (following abandonment of the Division allocations). Afrer withdrawal 25173 had reached Gresty Lane by March 22nd, remaining here until July 29th when it was joined to 25201 & 25288 on the 9L37 10.50 Basford Hall - Leicester Humberstone Road. The next day it was tripped as the 9T16 08.00 Humberstone Road - Vic Berry's, with 27045 added to the three Class 25s. However the Class 25 was sold into preservation and moved from Vic Berry's yard to Crewe Works between September 13th 1987 & October 2nd 1987 for repair. The locomotive was found to contain asbestos so remained at Crewe until June 15th 1988 when it moved as the 9R78 10.00 Crewe Works - Humberstone Road, being tripped into Berry's yard the next day (also recorded as moving on June 21st 1988 and reaching Vic Berry's yard on June 28th 1988). With the asbestos removed it left Vic Berry's yard on January 19th 1989 for Leicester depot, where it remained until May 12th 1989 when it moved as the 9R66 16.10 Leciecter - Basford Hall, and taken from there to Crewe Works on June 1st 1989. 25173 would be named 'John F Kennedy' at BREL Crewe on July 21st 1990. Photograph courtesy Mark Jones Its July 11th 1987 and the majority of the Class 25s are stored in the Crewe area. Here 25173 & 25089 heads a line of the withdrawn Type 2s at Crewe Gresty Lane. Noted Derby Works July 1967. Noted Derby Works April 1968. Noted Derby Works June & August 1974 (continuous?). Noted Derby Works September & October 1976. Noted Derby Works January 1977. Noted Derby Works Open Day 1977. 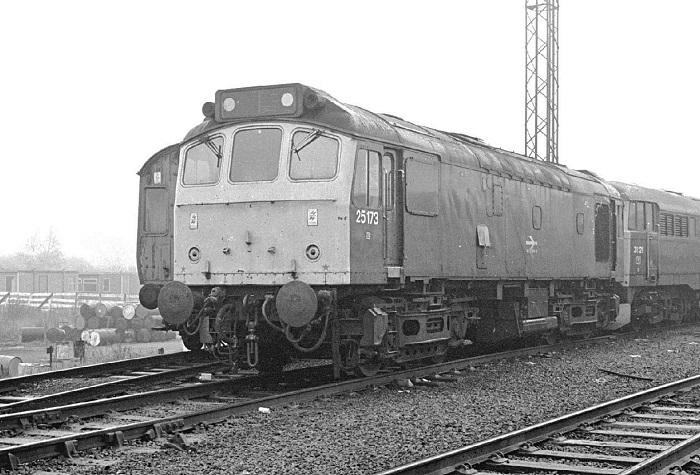 The frames for D7523 were laid at Derby during the autumn of 1964 with delivery taking place in January to the Nottingham Division, one of a continuous batch of forty seven so allocated. On August 12th the summer dated Nottingham - Llandudno Town roundtrip was worked by 7523 & 7511. On July 13th the summer dated Nottingham - Llandudno Town roundtrip was worked by 7523 & 7528. With the summer season in full swing the seasonal extras were again running with June 20th's Nottingham - Llandudno Town roundtrip in charge of 7523 & 7528. 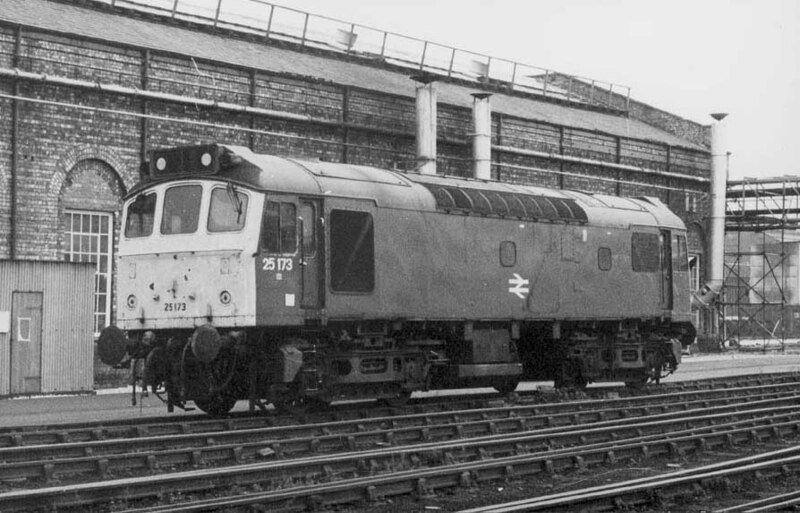 On the late evening of May 25th 7523 was noted at Willesden depot. Ascot Week saw a number of specials arriving in the hands of Class 47s, however two from Manchester Piccadilly received Class 25s between Willesden and Ascot, 7523 & 7530 on June 20th and 7645 & 7662 on June 21st. 25173 was noted northbound through Nuneaton on July 5th with an ex-works electric unit, No.029. On November 24th the 17.10 Cardiff - Crewe was worked by 25173. Photograph courtesy Dave Homer It looks like a fine summers day as 25173 approaches Great Rocks Junction with another set of twelve empty wagons from Northwich, May 30th 1977. On July 16th the 08.52 Leicester - Skegness was worked by 25173 & 25131, the return working, the 12.30 Skegness - Leicester saw 25173 & 25131 work as far as Nottingham, where they were replaced by 25135 & 25205. On July 24th 25173 & 25143 worked the 08.45 Birmingham New Street - Barmouth and the return 17.30 Barmouth - Birmingham New Street. In May 25173 returned south to Cricklewood, though it first underwent a classified repair at Derby which included the fitting of dual brake equipment, being released back to traffic late in June. There was a multitude of Class 25s in the area of Bushey & Oxhey station from February 17th onwards following the dramatic derailment there of the 16th's 20.25 Euston - Manchester due to a track defect. The locomotive 87007 was the only part of the train to remain on the tracks, four of the MkIII coaches ended up on their sides, with one (M12162) bringing down the overhead gantries, which blocked the slow lines. Most fortunately there were only minor injuries. Three breakdown cranes attended; from Bescot, Finsbury Park - brought in by 25279 & 25256, and Old Oak Common - arrived behind 25152 & 25189. The slow lines were reopened late on the 17th, the dc lines late on the 19th, the fast lines by the 25th. Spoil trains used 25222 & 25243 and 25130 & 25173, this first pair returned with track panels on 21st, followed by 25256 on the re-wiring train. On June 18th the APT failed at Weedon with pantograph problems, 25173 was sent from Rugby to assist. On August 25th the 18.03 Blackpool North - Blythe Bridge was worked by 25173 & 25139, this pair also worked the same service the next day (the 18.05). On April 24th 25173 & 25141 worked the 20.55 Kensington Olympia - Stirling motorail to Willesden, returning to Kensington Olympia with the 23.40 Stirling - Kensington Olympia motorail. 25173 was the Manchester Victoria banker and station pilot on May 28th. When 40033 failed at Stalybridge on May 30th's 09.08 Scarborough - Llandudno it was left to 25173 to take the train forward. However on reaching Warrington the Class 25 succumbed, requiring 40140 to complete the journey! On June 20th 25173 & 25153 worked the 07.40 Euston - Aberystwyth forward from Wolverhampton, returning with the 16.05 Aberystwyth - Wolverhampton. The next day (21st) the same pair worked the 08.45 Birmingham New Street - Aberystwyth (via Bescot) and the 18.00 Aberystwyth - Euston to Nuneaton. On August 19th 25173 & 25194 worked the 08.00 Walsall - Bournemouth, presumably as far as Reading. An 'E' examination was carried out at Crewe during September. 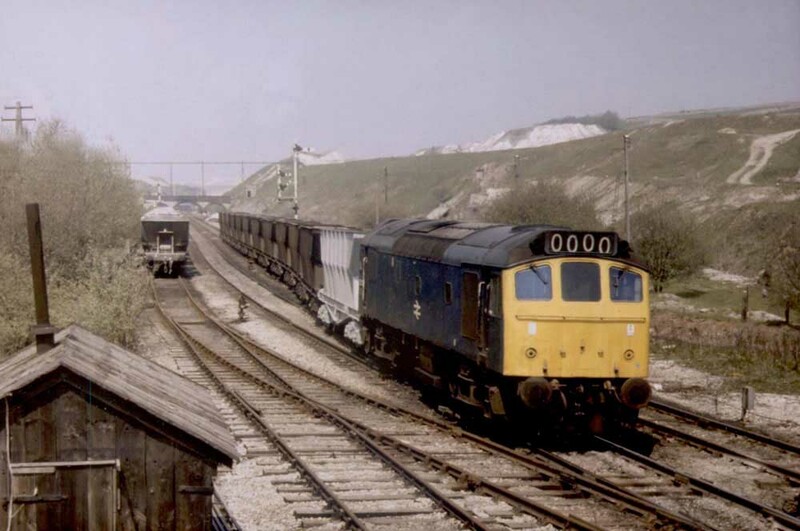 Photograph courtesy Mark Cook 25173 with a short train of coal hoppers is seen in the Aylesbury area on March 10th 1982. On August 12th 25173 was noted southbound at Sellafield with loaded bogie steel wagons from Workington. On August 22nd the 20.45 Barrow - Euston with 86218 was assisted between Watford Junction & Willesden by 25173 due to the power being off for engineering work. On September 5th 25173 assisted two electric services between Watford Junction & Willesden due to the power being off for engineering work. On May 15th 25173 & 25229 were noted at Aintree Sefton Arms with a loaded ballast train. A hot July 13th saw 25173 assist a failed HST (power cars 43055 & 43082) forward from Oakley (north of Bedford) to Nottingham, the service was over an hour late at Leicester. On August 21st 25173 & 25191 dragged an electric service behind 86207 between Bletchley & Rugby, the power off for engineering works. 25173 & 25161 were noted passing Crewe on August 25th with the loaded sand wagons from British Industrial Sands Ltd, Oakamoor to Ravenhead Glass, St. Helens. On a snowy December 12th 25173 was noted light engine at Banbury. The final transfer for 25173 came in January, the new home being Crewe. On April 2nd 25173 was stabled at Kingmoor. On April 4th the 1M12 14:10 Cambridge � Blackpool service failed at Preston behind 47491. Cheers from watching enthusiasts arose when 25173 was seen coming off Ladywell House sidings to take the train forward to Blackpool. 25173 was noted at Carlisle station on April 4th on passenger stock. On April 24th 25173 as noted at Princes Risborough with three empty wine tankers destined for Acton and return to the continent. On April 26th 25173 was stabled at Bletchley. Preston continued to see Class 25s on passenger duty, 25173 worked the 17.03 Euston - Blackpool forward from Preston on May 18th, this was normally a Class 47 turn. 25173 was stabled at Bletchley on May 30th. The only record of 25173 on a Cambrian passenger turn in 1984 occurred on June 23rd, working with 25237 on the 1J20 07.35 Euston - Aberystwyth (from Wolverhampton) returning with the 2J84 Aberystwyth - Shrewsbury. 25173 was stabled at Bescot on June 26th. For reasons unknown 25173 took over the 11.45 Cardiff - Crewe on August 27th (deputising for the regular Class 33) and continued with the diagram until lunchtime on 30th. 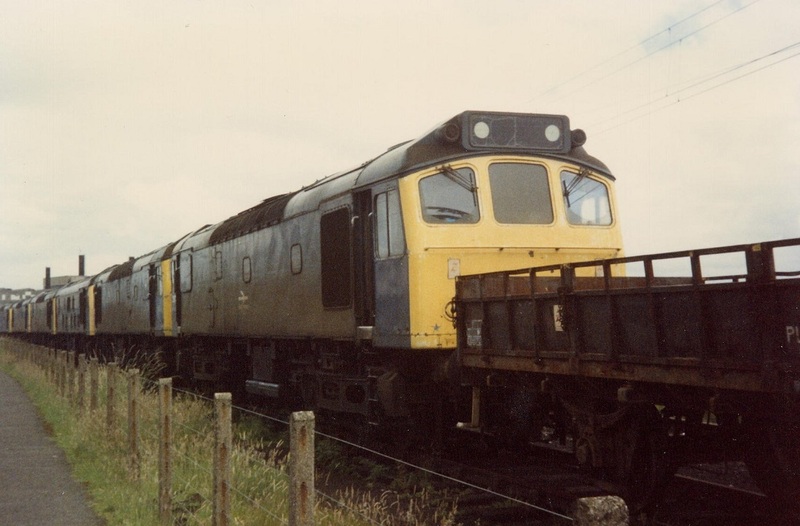 On each day one round trip was made, except for August 29th when two trips were run giving a total of 556 passenger miles, the highest daily total for any Class 25 in 1984, although it was jointly shared with 25211 which ran the same number of miles on August 24th. On September 20th 25173 worked the late evening Preston - Barrow service, returning the next morning on the 07.33 Barrow - Preston, assisted by 25206 from Dalton Junction. A round trip on the afternoon Derby - Crewe circuit occurred on October 16th, using hauled stock to cover for a non-existant diesel multiple unit. Another diesel multiple unit casualty on October 29th found 25173 assisting the late evening Worcester - Birmingham diesel multiple unit from Stourbridge. A late running long distance WCML service on the evening of February 22nd allowed 25173 to work a short Preston - Wigan relief. On March 12th 25173 worked the daily morning Ashburys - Dowlow trip, with the bulk of the consist containing five covered hoppers for Dowlow and numerous cement PCAs for Earles sidings. 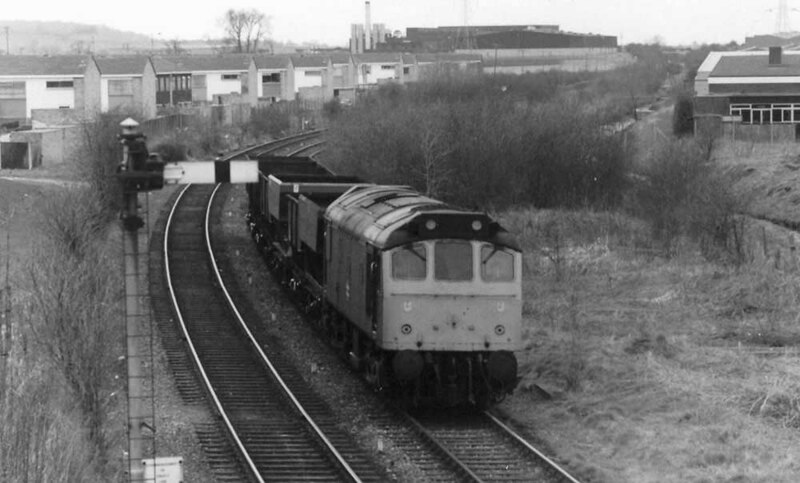 April 9th saw 25173 in charge of the 09.45 Severn Tunnel Junction - Bescot comprised of fourteen empty bogie steel wagons. 25173 was again noted at Severn Tunnel Junction on April 13th. Four days later (17th) 25173 & 25231 were in charge of a Cardiff - Gloucester parcels working. 25173 & 25229 were diagrammed on May 2nd for the first part of a Birkenhead North to Wolverton unfitted special, taking an electic multiple unit to Works for repair. Later that day a diesel multiple unit failure brought out 25173 to cover a late evening Manchester Victoria - Blackpool working. The afternoon of May 29th witnessed 25173 & 25201 on the ECML at Thirsk with a train of coal empties. 25173 was in the Derby area on June 13th being noted alongside the station with Railfreight wagons and noted southbound at Long Eaton with with an engineers train including electrification vehicles. By June 18th 25037 & 25173 were noted at St Helens Junction with an Oakamoor -Ravenhead sand train. Photograph courtesy Richard Howat On the same date as the opening view, July 17th 1985, 25173 has completed its journey with the 17.40 Carlisle to Glasgow Central. By July 20th 25173 was in the Manchester area being noted on a Redbank parcels working at Manchester Victoria. 25173 was still in the Manchester area on August 1st, being noted passing Manchester Victoria with a short civil engineers train. 25173 was the Manchester Victoria pilot on August 5th. August took 25173 on a couple of seaside visits, on August 7th a round trip Manchester Victoria - Bangor working took place, the eastward working did in fact run through to Newcastle, passengers forward from Manchester had to suffer the abomination of 31165. The next day (8th) 25173 was on banking duties at Manchester Victoria, whilst on August 9th it was noted at Warrington Arpley. On August 20th 25173 was noted at March with a train of merry-go-round hoppers. The next day (21st) 25173 covered a four coach 09.39 Long Eaton - Skegness relief (which should have started at Derby), the return working only going as far as Nottingham as the 1Z98 18.35 relief working. Was this the last Class 25 to reach Skegness? On August 22nd 25173 worked the 3M38 03.29 Leeds PCD to Birmingham Curzon Street PCD. On September 5th 25173 was noted with loaded ballast wagons at Llandudno Junction. On September 6th 25173 was noted at Abergele & Pensarn with a lengthy eastbound freight. Two WCML drags occurred in September, between Norton Bridge - Stafford on 8th & Crewe - Stafford on 17th. 25173 & 25213 were noted stabled at Severn Tunnel Junction September 15th. Another short hop took place on October 24th with 25173 working between Blackpool & Preston on a morning Euston bound service. 25173 was noted at Hereford on October 6th with a train of continuously welded rail. 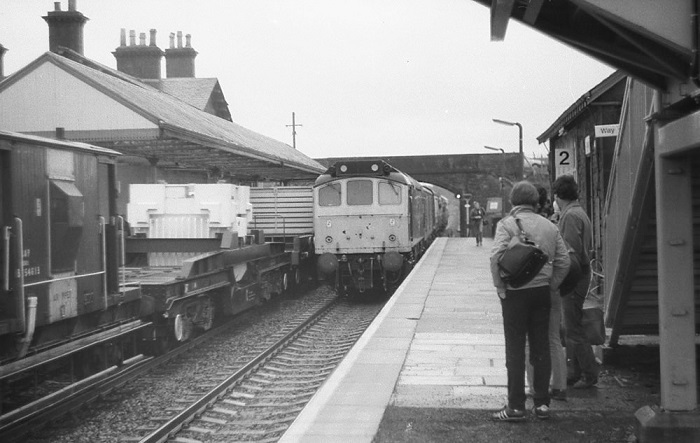 Photograph courtesy Tony Sayer It has been two years since Toton lost it's allocation of Class 25s, but they would continue to visit until the March 1987. Seen here on November 30th 1985 25173 sits out a typical damp/misty November day. On January 9th 25173 worked the 21.42 Preston - Liverpool, being a portion off the 1M40 18.15 Glasgow - Manchester. Present at Immingham on March 4th working steel empties was 25173, two days later the locomotive handled a Bescot - Banbury freight. On March 7th 25173 was noted at Bristol Bath Road. On March 11th (or 12th) 25173 worked the 08.46 Leicester - Birmingham New Street, filling in for a diesel multiple unit failure. 25173 and four Class 20s were noted arriving at Warrington Arpley stabling point on March 29th. On April 4th the 14.10 Cambridge - Blackpool North with 47491 failed at Preston, 25173 took the service forward to Blackpool North. The next day (5th) overhead line damage saw 25173 assist the 22.50 Euston - Glasgow Central between Preston & Lancaster. On April 7th the electric locomotive hauling the 07.25 Barrow - Euston fail at Preston, 25173 took the service forward to Warrington. On May 7th 25173 worked the empty oil tanks from Aberystwyth to Stanlow(?) On May 8th the 16.20 Holyhead - Euston failed at Colwyn Bay behind 47448, 25313 pushed the train to Rhyl where 25173 took the service to Crewe. On May 24th 25173 was noted at Manchester Victoria with parcel vans for Red Bank sidings, and later noted with 25059 as the Miles Platting banker. On May 27th 45131 failed shortly after departing Manchester Victoria with the 12.03 Liverpool - Scarborough. The train was reversed back into platform 12, where the station pilot 25173 was attached to take the train forward to York where the service was terminated. 25173 was noted at Warrington Bank Quay with permanent way vehicles on May 29th. 25173 was noted at Llandudno Junction on June 12th shunting two Presflo (?) wagons. On June 18th 25173 was eastbound at Colwyn Bay with a lengthy train of hopper wagons. 25173 was the station pilot at Manchester Victoria on June 27th. 25173 was in the Crewe area during early July, being noted on the stabling on July 9th and passing through the station on July 10th with a train of eleven bogie engineers wagons. The 20.30 Manchester Victoria - Blackpool North and the return 22.45 Blackpool North - Manchester Victoria were hauled by 25173 using hauled stock on July 16th. 25173 was noted with an engineers train at Crewe station on July 19th. Three days later (22nd) the 16.20 Manchester Victoria - Blackpool North was lauled by 25173. 25173 was noted passing through through Crewe station with a mixed freight on August 7th. On August 21st & 23rd 25173 was noted stabled at Stoke on Trent station. When the 18.58 Great Malvern - Birmingham New Street diesel multiple unit failed (?) at Old Hill on September 9th, 25173 assisted through to Langley Green. 25173 was noted running through Manchester Victoria light engine on September 26th. A Labour Party Conference relief on October 3rd saw 25173 work the 14.05 Blackpool North - Euston to Preston. Possibly 25173's last passenger working for 1986 was the 21.40 Preston - Wigan NW relief service on November 3rd. On December 22nd 25173 was noted through Stafford on loaded sand or stone wagons. For 25173 much of the Christmas week was spent in the Toton area, being noted there on 24th & 29th and January 2nd. After starting the New Year at Toton 25173 soon returned to Lancashire, being at Newton Heath depot at midday on January 8th. 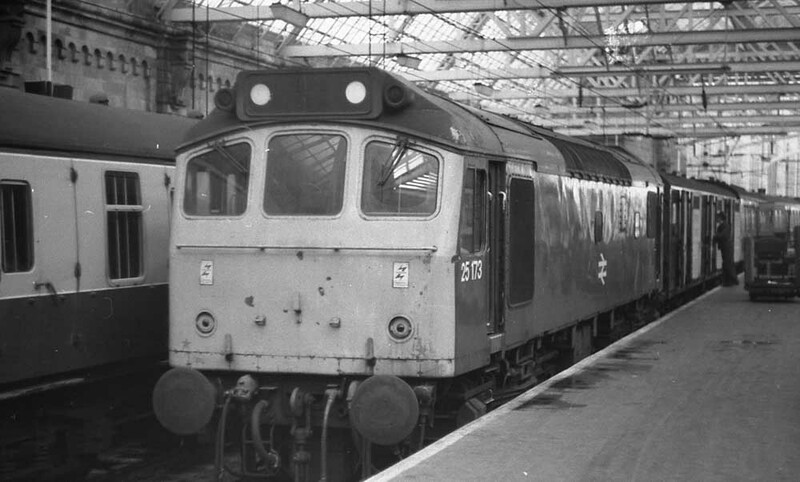 It was allocated the 3J05 to Manchester Victoria followed by the 01.00 1D00 Manchester Victoria to Bangor. This sequence of events was repeated on January 11th. Red Bank sidings was reached on the evening of 13th allocated to the 3J08 to Manchester Victoria, then the 1S03 22.47 Manchester Victoria - Glasgow/Edinburgh as far as Preston. On the afternoon of January 14th a journey to Northampton was completed, followed by a local job to Rugby. By the afternoon of January 24th 25173 had arrived at Bletchley, then allocated to the following morning's 2L45 to Watford Jct, taking up job BC07 to Willesden. 25173 remained in the Willesden area until at least February 1st, handling numerous local jobs. At teatime on February 10th 25173 & 25278 were at Carlisle allocated to the 7S52 to Fairlie High and the return 7M22 to Carlisle. 25173 was noted stabled at Carlisle station sometime on February 11th, possibly before its trip across the Pennines to Tyne Yard on the 6E86, returning with the 6M26 to Carlisle Upperby. The evening of 12th found 25173 still paired with 25278 to work the next day's 3S07 02.50 Carlisle - Ayr and 5S07 to Falkland Yard. February 13th was spent around Ayr, in the early morning of 18th 25173 was en-route from Carlisle with the 3S07 & 5S07 again, returning to Carlisle that same evening. Three days were spent at Motherwell (21st - 23rd) on local trips. A move north to Polmadie on 24th found 25173 & 25278 allocated on the 1M65 22.37 Glasgow Central - Nottingham to Carlisle. At breakfast on the last day of February 25173 was noted at Dalrymple. From March 3rd to 9th 25173 seems to have worked many miles between Carlisle and Ayr on the 3S07 & 5S07 and return workings. On 8th a side trip, the 9Z61 to Barassie was made. At lunchtime on March 12th 25059 was at Dumfries. By lunchtime on March 16th it was back to Manchester Victoria to handle the 6Z45 to Basford Hall, then light engine to Newton Heath. Here it worked the 0J18 to Stalybridge and 3J18 to Manchester Victoria. On 17th a morning trip was made to Ince Moss, getting back to Manchester Victoria at 12.35 Also handled was the 4P05 Mayfield to Preston. March 18th saw it work the 3J04 05.08 Bangor - Red Bank parcels and later the 0K37 to Guide Bridge followed by the 6K37 to Nuneaton Hartshill, returning with the 7H55 to Guide Bridge. The final working for 25173 was the 6Z40 07.30 Glazebrook - Parkeston Quay on March 19th as far as Crewe, here it was removed from the train and taken out of service. 25173 was withdrawn on March 19th 1987. Photograph collection of webmaster 25173 at Crewe Works for repair following its purchase for preservation - seen here probably in the last quarter of 1987. No.1 cab front: number stencilled on cab front in black: May 1986 until withdrawn (not carried on the No.2 cab front). No.1 end cab roof, drivers side: significant areas of missing paint: June 1984 - August 1985. With thanks to Alan Baylis for the 1984/85 passenger movements & to Neil Cannon for the comprehensive 1987 TOPS movements. Page added February 7th 2002. Page updated April 11th 2019.